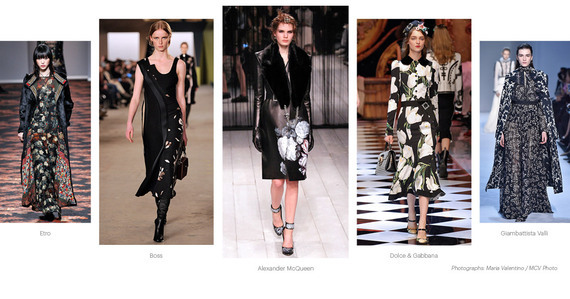 Ease your way into autumn--by wearing florals in jewel- or neutral-tones on a black background. The effect: neo-Gothic/Victorian, Penny Dreadful-type blossoms...Slightly dangerous, powerfully alluring. Clearly, these prints are not your garden-variety. So pick your blossoms carefully: Some pieces are ideal for work, others for evenings out. Etro If you ever needed proof that florals don't have to be "girly," here it is. Veronica Etro's maxi-dress and -coat have an almost sinister feeling. Midnight in the Garden of Good and Evil, but in an appealing way! Boss This slinky number by Jason Wu for Boss also defies your flowery expectations. The gilded print is almost abstract, while the curved satin seam provides a sensuous counterpoint. Alexander McQueen A coat worthy of a film noir goddess, this fitted leather topper boasts hand-painted peonies and roses to a dark, sultry effect that is far from sweet. Dolce & Gabbana Are they oversize Calla lilies? They are definitely not "shy violets." Despite the long sleeve and mid-calf hem, this dress exudes subtle sexuality with its fitted silhouette and flouncy hemline. Giambattista Valli There is something almost Goth about this ensemble. The floor-length gown and long coat, worn cape-like over the shoulders, are worthy of a glamorous vampire...or a grand dame. The ultimate entrance-maker. Prep for a cool-down These dresses and blouses are comfortable during the last weeks of summer. Then, when Fall kicks in, add tights,a cardigan or leather jacket and you're good to go. We love the transition value of a floral silk cold-shoulder blouse from IRO, as well as a burgundy-floral print dress from Needle & Thread (showing the Victorian trend too), a vine-print snappy dress from Proenza Schouler or a floral tie-neck dress from Banana Republic (ideal for work). Pick a partner Floral separates combine beautifully with the solids in your closet, whether it's an Alice and Olivia embellished bomber jacket, a silk Cinq á Sept top, printed silk pants from Theory or crepe straight-leg pants from Etro. Savor a look maker There's something about dark florals that can inspire designers to scale some dizzying heights. Submitted for your consideration: embroidered sandals from Aquazurra, luxurious slip-on Gucci loafers, a crisp pleated skirt with over-sized blooms from Vivienne Westwood, an exotic shoulder bag from Elizabeth and James. It's all about fearless flora as opposed to frou-frou!